Successful innovation is the cornerstone of continued economic prosperity in developed economies such as Ireland. Maintenance of jobs and investment requires a strategy of moving up the value chain and leveraging the relative educational advantage toward the creation and use of knowledge in a knowledge-based economy. Accountants have an important role to play in creating a control environment that promotes and supports the creation and application of knowledge through successful innovation. Dr Curtis and Dr Sweeney’s work in the area of management control systems and innovation was initiated by an RDI fellowship grant received in 2008. They carried out research in two highly innovative indigenous Irish companies (one in the medical devices industry and one in green energy building products) funded by the Irish Accountancy Educational Trust. This research used Simons’ Levers of Control (LOC) framework as a theoretical lens to analyse these case studies. Simons’ framework, although developed in the 1990s, has recently attracted significant attention in the management control literature and the potential for its exploitation to explain developments in control systems as diverse as strategy formulation, innovation management and corporate social responsibility has been recognised. 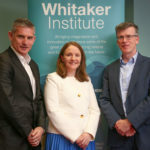 As its popularity grows, we are seeking to build on our existing expertise in the LOC framework to contribute to the development of an internationally recognised centre for excellence in the application of this framework at the Whitaker Institute, NUI Galway.